We start the day at the Museum of Science and Industry. 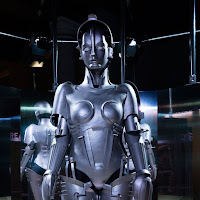 The special exhibition is Robots (entry fee extra). We think of robots as a modern invention, but we've been harnessing the power of robotics for more than 500 years. 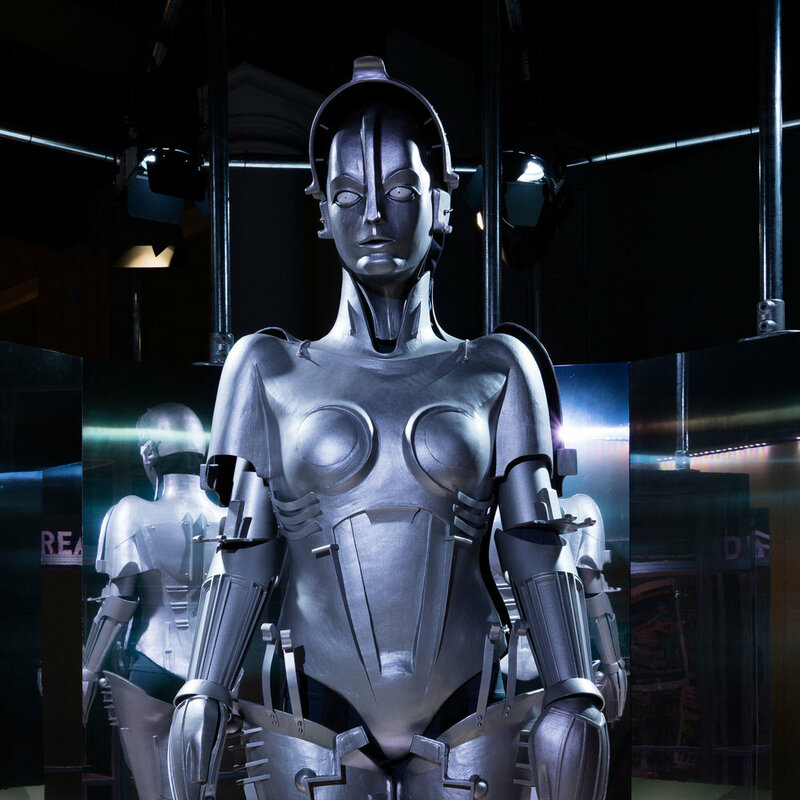 Get close to a unique collection of over 100 robots, from a 17th century dancing wine goblet and an animatronic baby, to Maria from 1927 film classic Metropolis and a news-reading android from Japan. Go behind the scenes and discover recent developments in robotic research, and learn how robots are being built to resemble us, interact with us and think like us. On 15 December 2015, Major Tim Peake embarked on the Principia mission to the International Space Station, where he spent six months orbiting Earth. Thanks to extraordinary leaps in communication technology, we watched as he broadcast live experiments, walked in space and even ran the London Marathon. 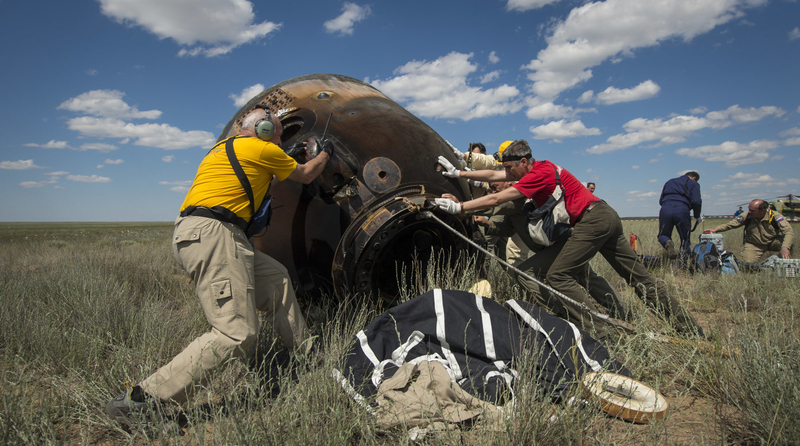 On 18 June 2016, Tim returned to Earth in the Soyuz TMA-19M descent module. Now you can have a once-in-a-lifetime opportunity to get a close look at this historic spacecraft - complete with scorch marks from its re-entry through the atmosphere. The museum's permanent collections, based around the world's first railway station, includes trains and steam engines, the history of the textile industry that made Cottonopolis, and the Air and Space Hall. After lunch we visit Elizabeth Gaskill's House. The House, now a Grade II* listed property, was built between 1835-1841 on the outer edge of the growing city. It was built as part of a new suburban development planned by Richard Lane and is a rare example of the elegant Regency-style villas once popular in Manchester. During the time Elizabeth lived here she wrote nearly all of her famous novels, including Cranford, Ruth, North and South and Wives and Daughters. She also wrote the biography of her friend Charlotte Brontë, plus many lively letters. 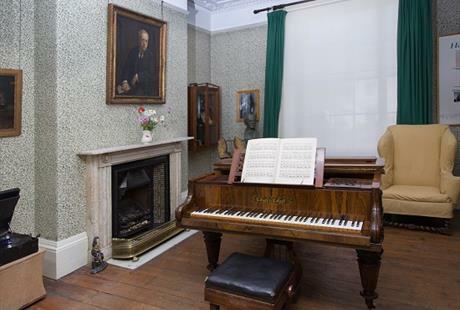 Notable visitors to the House included fellow writers Charlotte Brontë, Charles Dickens, John Ruskin, the American abolitionist and novelist Harriet Beecher Stowe and musician Charles Hallé. William and his two unmarried daughters, Meta and Julia, continued to live in the house after Elizabeth’s death in 1865. When Meta died in 1913 the house and its contents were sold. Visitors to the house can find out about Elizabeth and William’s work, explore the lives of their daughters and servants and discover the Manchester that the Gaskells knew. Nearby is the Pankhurst Centre. 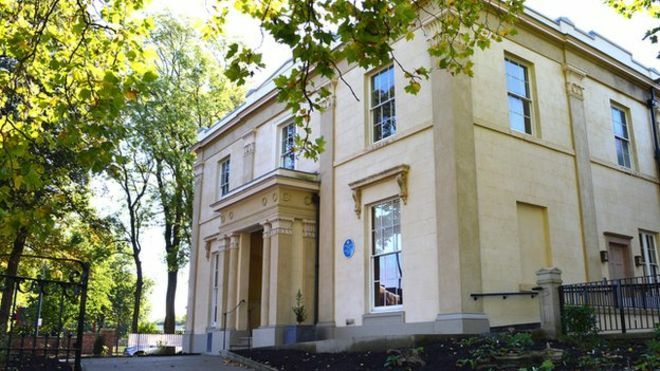 It is the birthplace of the Suffragette movement, and now houses a small museum and heritage centre that remains as a legacy to the Pankhurst family and the Suffragette movement, and also serves as a women’s community centre. 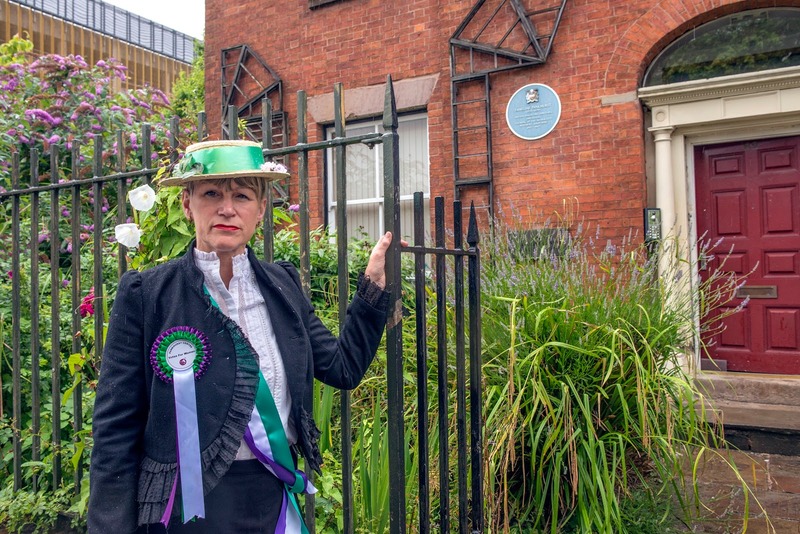 This historically significant building was the home of Emmeline Pankhurst and her family who led the Suffragette campaign for Votes for Women, and is the place where the first meeting of the Women’s Social and Political Union was held. The heritage centre has information about the Pankhursts and the Suffragette movement. We spend the first part of the day in the historic Cathedral City of Lichfield. 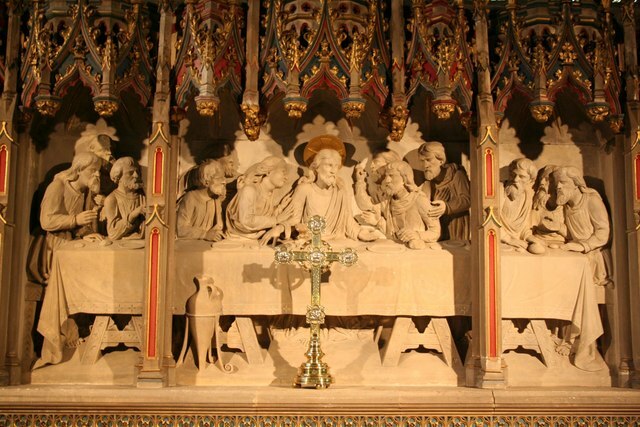 The first cathedral was consecrated on Christmas Day 700. A new cathedral was build by the Normans following the 1066 invasion and then re-built in the gothic style, being completed in c1340. It suffered severe damage in the Civil War, being besieged three times. The interior was re-arranged in the 18thC, and restored in the 19thC, resulting in the building you see today. 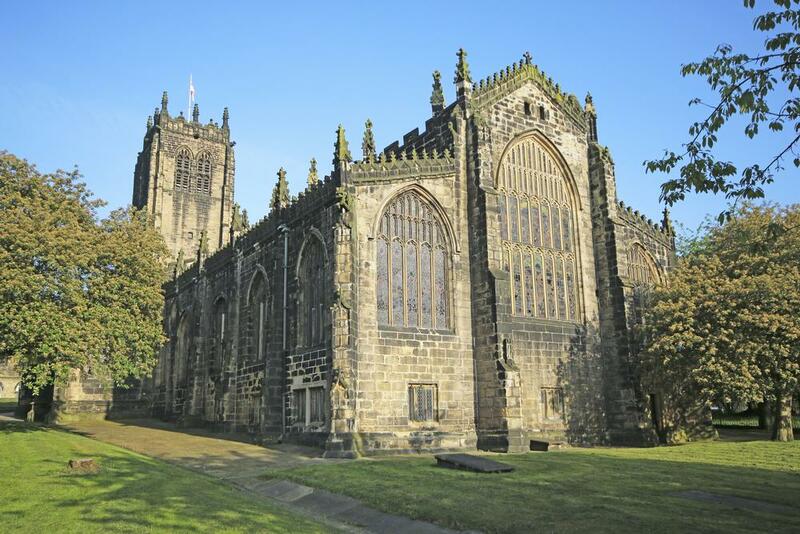 It is the only 3-spired cathedral in the UK. 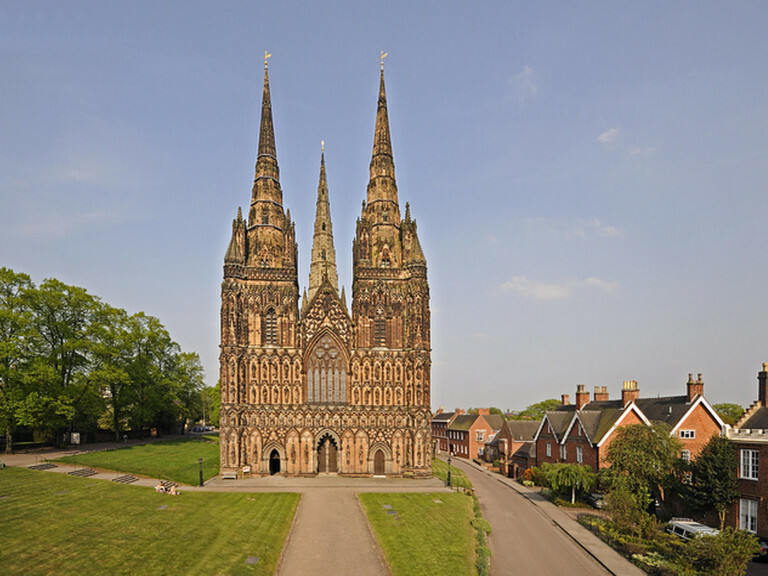 Other Lichfield attractions include the Erasmus Darwin House (grandfather of Charles Darwin) and Samuel Johnson Birthplace Museum (author of the first English dictionary). The Old Guildhall Prison Cells have been on this site since 1548. See original cells, discover the inmates' stories and find out about law and order in Lichfield in this small display. After lunch we move on to the National Memorial Arboretum. 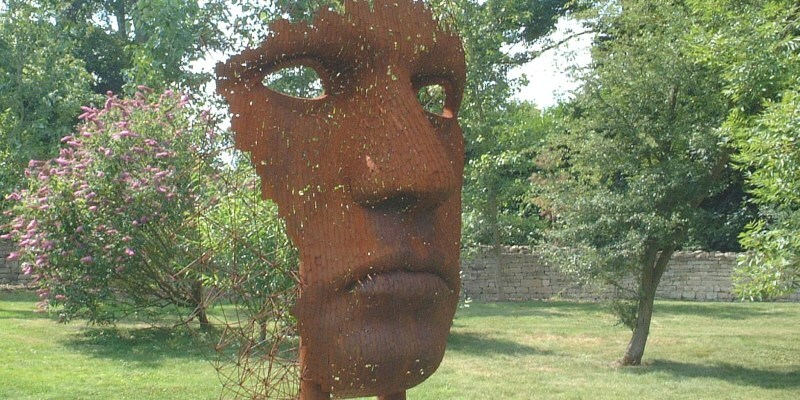 The Arboretum is an evolving, maturing woodland landscape featuring 30,000 trees and a vast collection of memorials. The 150-acre site is a living, growing tribute to those who have served and continue to serve our country. The Arboretum is home to over 350 thought-provoking memorials, each with a story to be discovered. 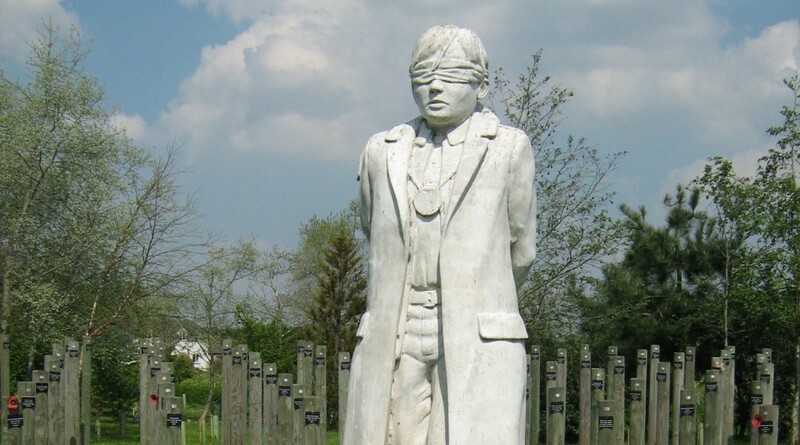 The memorials are diverse in nature, rich in symbolism and collectively represent a broad population of society from military associations, charitable organisations, emergency services, fraternity groups and individuals. Each year new memorials are added so there's always something new to see. We spend the day at Bletchley Park, just outside Milton Keynes. 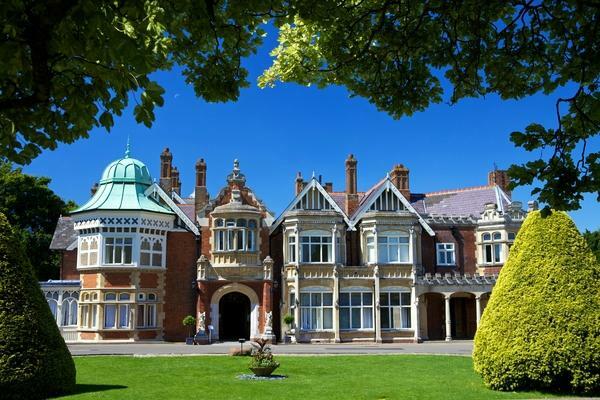 Bletchley Park is a place of exceptional historical importance. 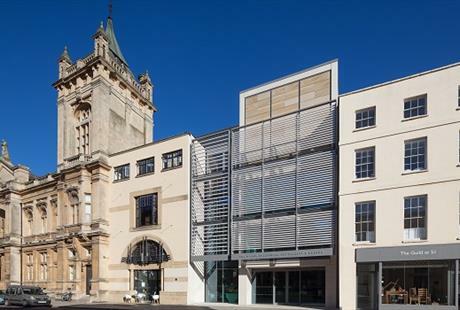 It is the home of British codebreaking and a birthplace of modern information technology. It played a major role in World War Two, producing secret intelligence which had a direct and profound influence on the outcome of the conflict. 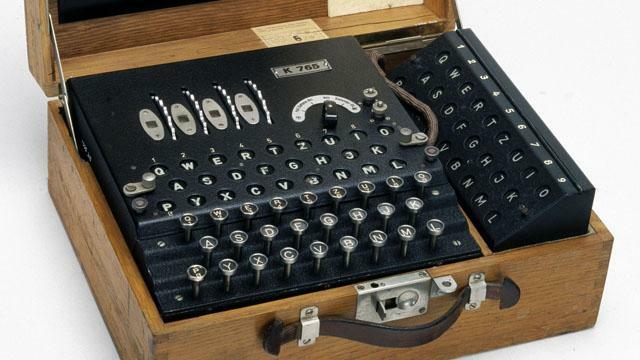 The Enigma coding machine offered 159 million million million possible settings to choose from, which the Germans believed unbreakable. The Poles had broken Enigma in as early as 1932, but in 1939 with the prospect of war, the Poles decided to inform the British of their successes. Dilly Knox, one of the former British World War One Codebreakers, was convinced he could break the system and set up an Enigma Research Section, comprising himself and Tony Kendrick, later joined by Peter Twinn, Alan Turing and Gordon Welchman. They worked in the stable yard at Bletchley Park and that is where the first wartime Enigma messages were broken in January 1940. Enigma traffic continued to be broken routinely at Bletchley Park for the remainder of the war. 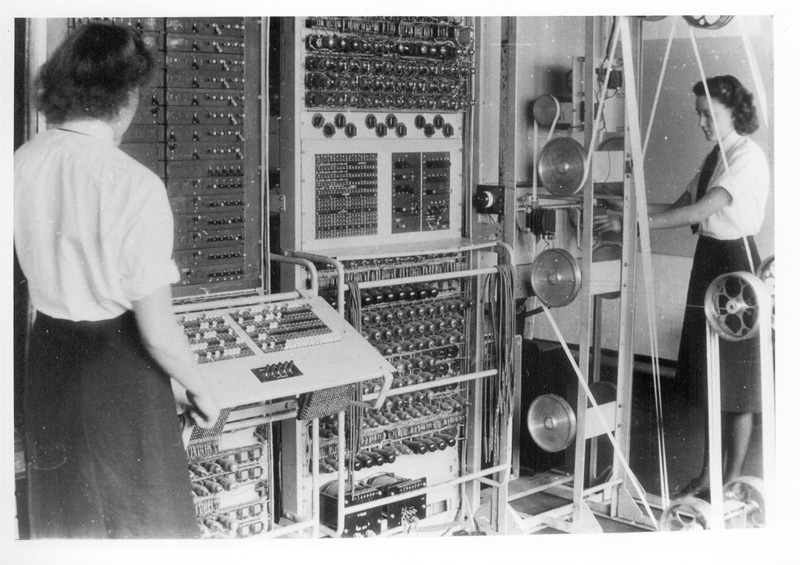 Perhaps Bletchley Park's greatest success was breaking the Germans' strategic ciphers. These complex ciphers were used to secure communications between Berlin and Army commanders in the field. Messages consisted of teleprinter code encyphered with the highly complex Lorenz cypher machine. Under Professor Max Newman the ‘Newmanry’ started to devise machines to mechanise the process of decoding. This ultimately led to the design and construction by the brilliant General Post Office (GPO) engineer Tommy Flowers of ‘Colossus’, the world’s first semi-programmable electronic computer. Breaking into these ciphers allowed the Allied staff planning for the invasion of Europe to obtain unprecedented detail of the German defences, and to see into the minds of the enemy commanders including Hitler himself. See a reconstruction of Colossus on display. We visit on a 1940s reenactment day, with military vehicles, live music, demonstrations and costumed characters on display.You're welcome to come along in period costume! 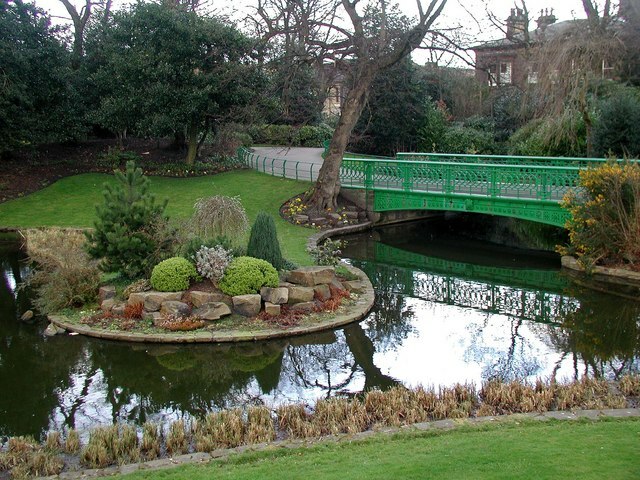 Cheltenham has been a health and holiday spa town resort since the discovery of mineral springs there in 1716. The visit of George III with the queen and royal princesses in 1788 set a stamp of fashion on the spa. Imperial Gardens, which can be found at the rear of the Town Hall, were originally planted out for the exclusive use of the subscribers to the Sherborne Spa. The spa was constructed in 1818 on the site now occupied by the Queens Hotel. 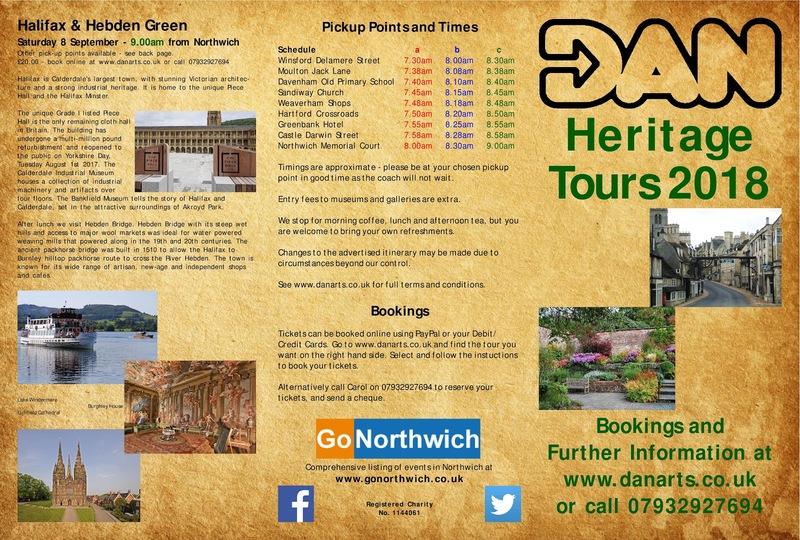 Over the intervening years, the gardens have undergone many changes, with the formal style you now see being laid out just after the second world war. Each year, approximately 25,000 bedding plants are used to produce the magnificent floral displays enjoyed by thousands of visitors every year. In the gardens you will find a statue of Gustav Holst, composer of The Planets, as the centrepiece of the hexagonal fountain. The Holst Birthplace Museum is located in Clarence Road. The Museum is located in the house in which Holst was born in 1874. The Wilson is an outstanding museum and art gallery with a programme of exciting temporary exhibitions and permanent galleries displaying World famous Arts and Crafts Movement collection inspired by William Morris, The story of Edward Wilson, a son of Cheltenham, and his explorations with Scott of the Antarctic. 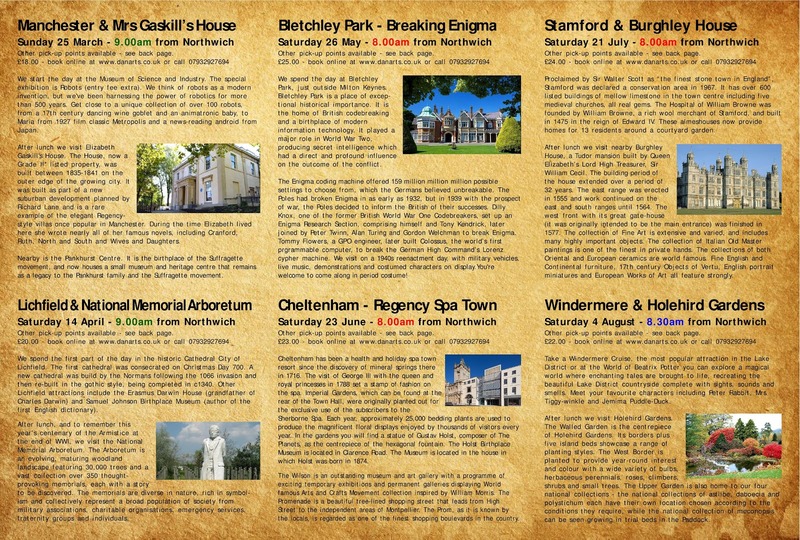 There is also a collection of important Dutch 17th and 19thC paintings, rare Oriental porcelain and English ceramics, plus the social history of Cheltenham, Britain's most complete Regency town. Neptune’s Fountain is one of Cheltenham’s most iconic landmarks and is a popular photographic spot with locals and tourists alike. It can be found at the southern end of the Long Garden and was made from Portland stone in 1893 by a local sculptor R. L. Boulton. Another popular statue is that of the Hare and Minotaur, a large bronze sculpture created by Gloucestershire-based artist Sophie Ryder in 1995 that can be found on The Promenade. The Promenade is a beautiful tree-lined shopping street that leads from High Street to the independent areas of Montpellier. The Prom, as it is known by the locals, is regarded as one of the finest shopping boulevards in the country. Running parallel to the Promenade is Regent Street, which has numerous bars and restaurants. Montpellier is an area where independent fashion, antiques and lifestyle boutiques sit alongside cafes and wine bars. Spot the stone sculptures known as Caryatids (modelled on the Acropolis in Athens), which add to the deliciously continental feel of the area. 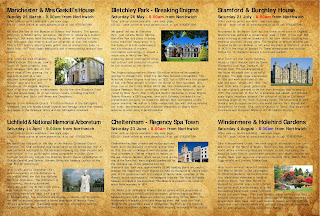 Tourist Map of Cheltenham here. 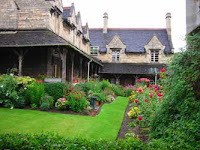 The Hospital of William Browne was founded by William Browne, a rich wool merchant of Stamford, and built in 1475 in the reign of Edward IV. These almeshouses now provide homes for 13 residents around a courtyard garden. Several rooms can be visited. In the Town Hall you can discover the story of Daniel Lambert, once Britain's fattest man, plus the history of the town and the Bull Run. All Saint's Church dates back to the 13th Century and was rebuilt by the Brownes after suffering damage during the Wars of the Roses. This striking church in Red Lion Square has Browne family memorial brasses, a carved angel roof, stained glass windows and a reredos of the Last Supper. St. Leonard’s Priory was founded in the early 12th Century by the Benedictines of Durham Abbey. Its purpose was to manage the order’s southern estates and prepare students for entry into Oxford University. It fell into disrepair following its dissolution in 1536 and today all that remains is the nave and arcade of which the magnificent west front is a feature. The George Hotel was an important coaching inn in the 17th and 18th centuries and possibly dating from the 10th century. It flourished until 1461 when Lancastrian forces destroyed much of the town, however the main block was rebuilt in 1597 by Lord Burghley, hence his coat of arms over the entrance. 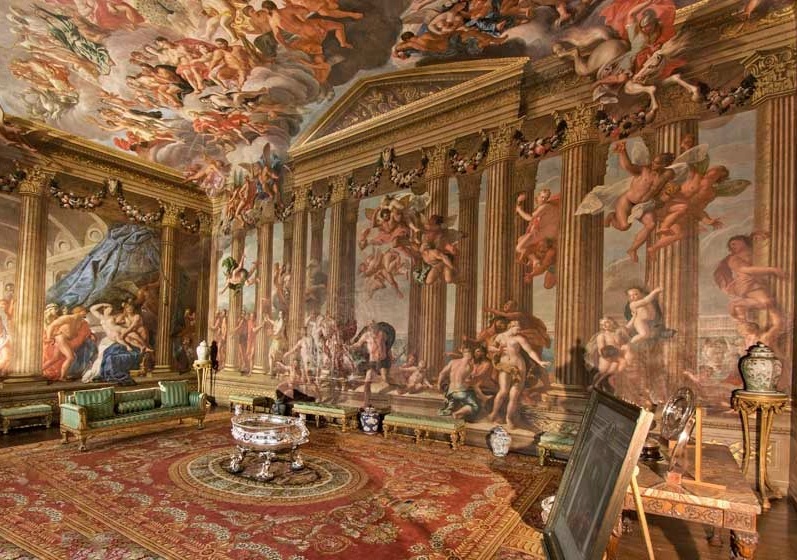 Famous guests include King Charles I, William III and Sir Walter Scott. After lunch we visit nearby Burghley House, a Tudor mansion built by Queen Elizabeth’s Lord High Treasurer, Sir William Cecil. The building period of the house extended over a period of 32 years. We know from the State Papers that the east range was erected in 1555 and work continued on the east and south ranges until 1564. 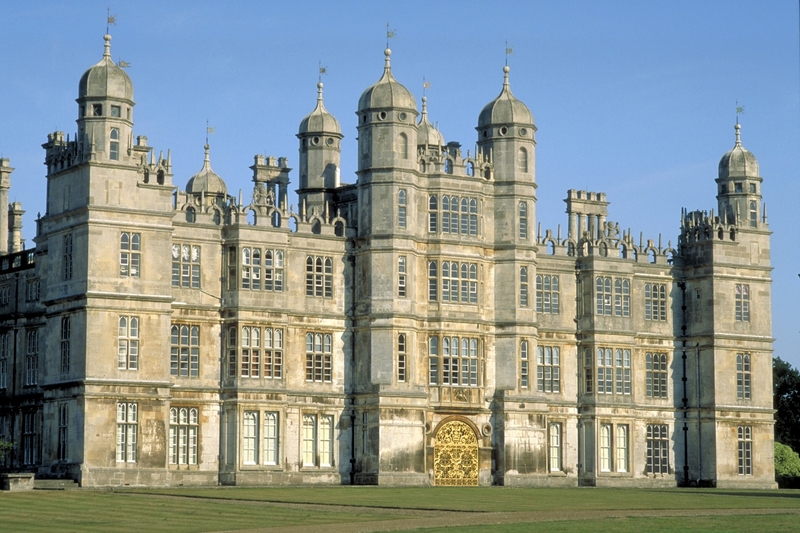 At Burghley in August 1564, Edmund Hall, the surveyor, promised that the south side should be finished by winter. Thereafter, little more work was done until 1575 when the team of masons was reassembled. The west front with its great gate-house (it was originally intended to be the main entrance) was finished in 1577. The north front was completed in 1587. The gardens and parkland that you see today at Burghley were largely designed by Lancelot ‘Capability’ Brown in the 18th century. The Garden of Surprises contains many interactive fountains, cascades and water features. On entering the sculpture garden visitors are welcomed by a mixed array of trees and shrubs for all seasons, many framed with an evergreen backdrop of common laurel. These shrubs form a major structural element within the gardens, forming archways and external rooms where discreetly hidden sculptures can be found. Viewed from the windows of the state rooms above, the South Gardens are dominated by the mature Oak and Lime trees, planted by Queen Victoria and Prince Albert respectively, in 1844. The yew hedges and topiary were added in the late 19th Century in a bid to reinstate some sense of a formal parterre or garden after so much was so boldly swept away in the 18th Century. The town of Windermere grew around the railway station, about a mile and a half from the lake. The village was originally called Birthwaite, but the railway company decided to call the station after the lake. Over the years, the little town has become merged with the older lakeside town of Bowness-on-Windermere, though the two have quite separate centres. 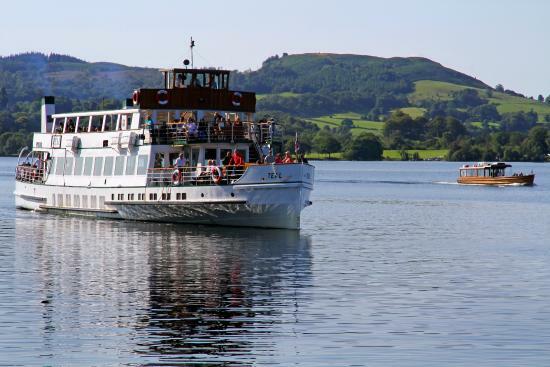 Take a Windermere Cruise, the most popular attraction in the Lake District. At the World of Beatrix Potter you can explore a magical world where enchanting tales are brought to life, recreating the beautiful Lake District countryside complete with sights, sounds and smells. Meet your favourite characters including Peter Rabbit, Mrs Tiggy-winkle and Jemima Puddle-Duck and step into Peter Rabbit’s Garden to see the cos lettuces that Benjamin Bunny nibbled on and the gooseberry bush where Peter got caught in a net as he tried to escape Mr. McGregor! After lunch we visit Holehird Gardens. 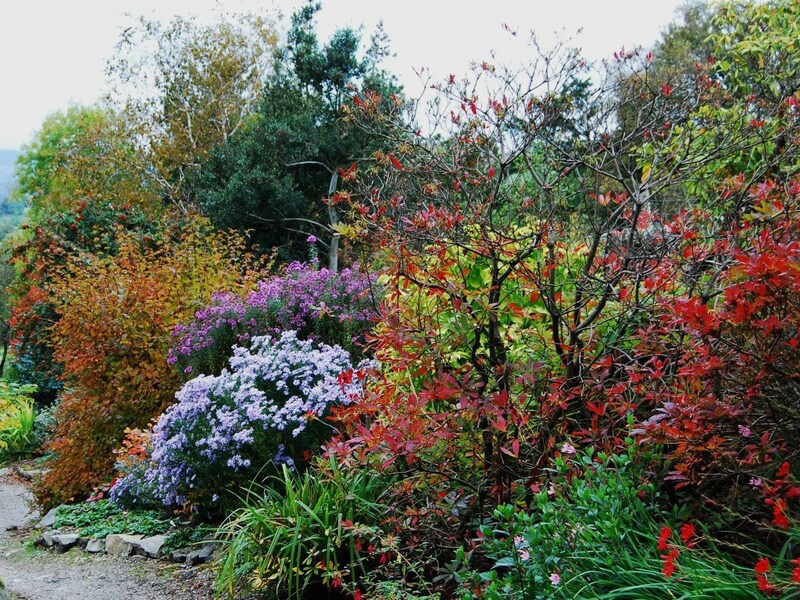 Holehird Gardens has been home to the Lakeland Horticultural Society since 1969. However, written records of Holehird go back to the 17th century when a large part of the area was owned by Thomas Hird and his family. In 1885 the Manchester industrialist John Macmillan Dunlop laid out formal gardens and had the present Walled Garden built with a range of heated greenhouses against the north wall, where Visitor Reception and LHS Members' Rooms now stand. The Groves family moved to Holehird in 1897 and continued the development of the grounds and garden, designing a rock garden and introducing many water features, including damming streams to form the tarn below the Mansion. In 1945 Henry Leigh Groves gave the estate to the County Council, to be held in trust. The Walled Garden is the centrepiece of Holehird Gardens. Its north-, east- and west-facing borders, and south-facing wall, plus five island beds showcase a range of planting styles. The West Border is planted to provide year-round interest and colour with a wide variety of bulbs, herbaceous perennials, roses, climbers, shrubs and small trees. The Upper Garden is the most diverse area of Holehird Gardens. 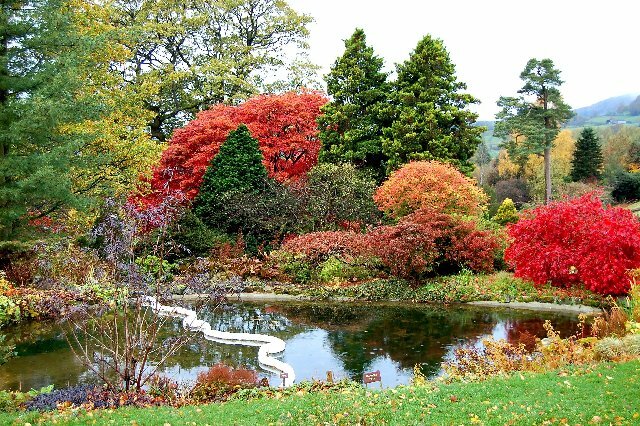 It occupies the full width of the Gardens, across the slopes of the fellside, with the upper parts accessible by bark and stone paths which are steep in places. 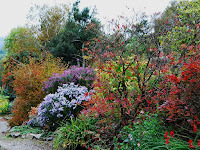 Here you will find the rhododendron and magnolia beds, as well as the autumn and winter borders. Rose beds and ornamental grasses can be found closer to the tarmac drive. The large Rock Garden was the first area to be developed by the Lakeland Horticultural Society when we came to Holehird in 1969. Nearby you will find the alpine and tufa houses, providing an opportunity for a close-up look at alpines. The Upper Garden is also home to our four national collections - the national collections of astilbe, daboecia and polystichum each have their own location within or close to the fellside area, chosen according to the conditions they require, while the national collection of meconopsis can be seen growing in trial beds in the Paddock. Map of Holehird Gadens here. Halifax is Calderdale's largest town, with stunning Victorian architecture and a strong industrial heritage. It is home to the unique Piece Hall and the Halifax Minster. The unique Grade I listed Piece Hall is the only remaining cloth hall in Britain. The building has undergone a multi-million pound refurbishment and reopened to the public on Yorkshire Day, Tuesday August 1st 2017. The Piece Hall is home to a range of shops, bars and cafes. 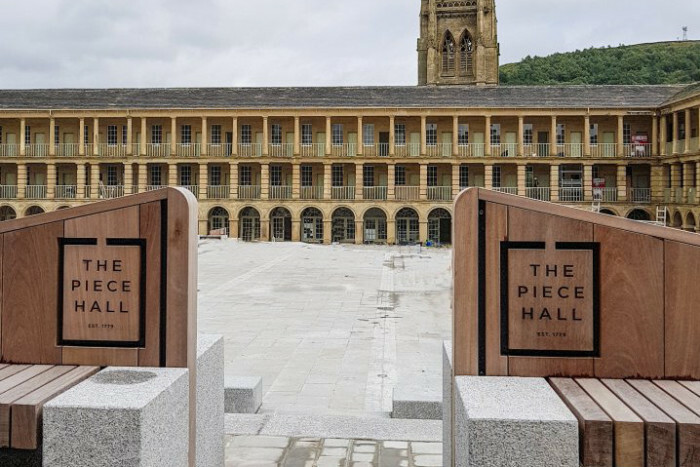 The Grade II* listed Town Hall is the work of Sir Charles Barry, designer of the Houses of Parliament and Halifax Minster is one of the finest buildings in Yorkshire and has been at the heart of the local community for over 900 years. The Calderdale Industrial Museum houses a collection of industrial machinery and artifacts over four floors. Some of the machines are the only surviving examples in the country and have been placed in settings to give a close representation to the time when they were fully operational in the not too distant past. Down in the basement, the oil engine ‘Sadie’ provides motive power for part of an extensive collection of locally-manufactured machine tools, including lathes, drills and planers. The Bankfield Museum tells the story of Halifax and Calderdale. Set in the attractive surroundings of Akroyd Park this Victorian mansion was the home of local mill owner, philanthropist and MP, Colonel Edward Akroyd. The Museum's displays cover local history, costume, art, toys, military history, jewellery and textiles from around the world. Just outside the town centre is a 15 foot high replica of the fearsome Halifax Gibbet, where thieves were beheaded for their crimes! A short walk away, the People's Park offers fountains, serpentine pools, statues, balustrading, cast iron bridges and a terraced promenade. After lunch we visit Hebden Bridge. 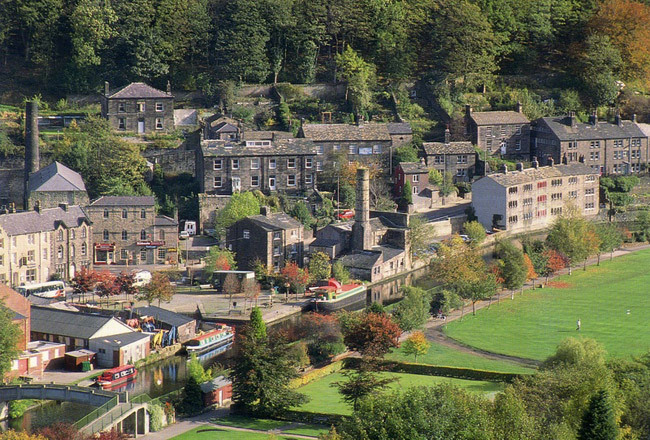 Hebden Bridge with its steep wet hills and access to major wool markets was ideal for water powered weaving mills that powered along in the 19th and 20th centuries. The ancient packhorse bridge was built in 1510 to allow the Halifax to Burnley hilltop packhorse route to cross the River Hebden. At one time Hebden Bridge became so famous for its clothing manufacture that it became known as Trouser Town. Some creative thinking in the past led to ‘upstairs-downstairs’ houses known as over and under dwellings. These were houses built in terraces with four to five storeys. The upper storeys face uphill while the lower ones face downhill with their back wall against the hillside. The bottom two storeys would be one house while the upper two to three storeys would be another. The Rochdale Canal, opened in 1804, passes through the town, where canal trips can be taken. 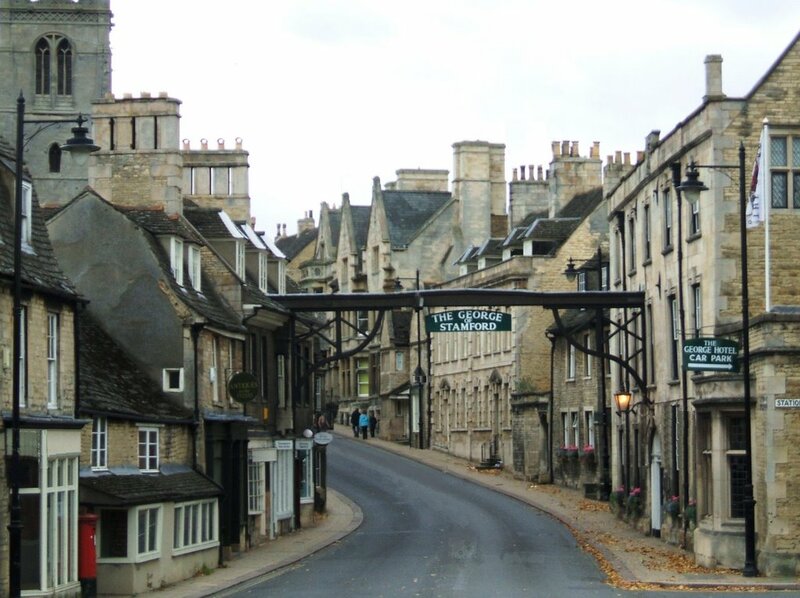 The town is also known for its wide range of artisan, new-age and independent shops and cafes. Hebden Bridge Tourism Guide here.